It was a dark and stormy night morning. There were bathrooms to clean. There was laundry to fold. There were children demanding attention. There was only one thing for our heroine to do. It was busy, it was colorful, it was inspirational. On the way home from the yarn store, I turned on the radio and the (bad) song "Morning Train" was playing. (You know, Sheena Easton. 1981. Now the tune will be stuck in your head all day.) I found myself wondering: is this woman really sitting around her house all day, ironing the sheets and organizing the Tupperware, until her man gets home at night? I mean, come on, lady; take up knitting! Write a blog! 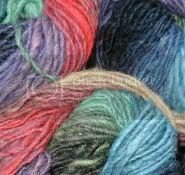 *I vaguely remembered that the new Interweave Knits had a bathrobe pattern using this yarn, so I checked it out once I was at home. The sucker has got to be pretty darn heavy, as you knit it with a double strand of heavy worsted yarn, and it's knee length. Once it was damp, it would probably sag down to your ankles. 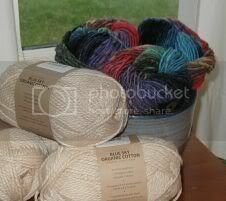 And a size medium requires seventeen 100g (150 yard) skeins. Yes, seventeen. At about $9 a skein, I don't think I'll be knitting myself a bathrobe anytime soon.